On Feb. 23, the Ohio State Alumni Club of San Antonio hosted the semi-annual Big Ten Alumni Council Bowling Tourney at Oak Hills Lanes. 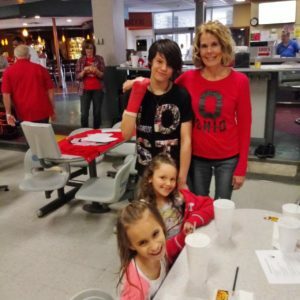 Thirty-one bowlers helped raise over $250 for the Big Ten scholarship fund. Congrats to our own Ohio State team (Joyce B., Joyce H., Michele and Alex) for placing 1st followed by the team from Wisconsin/Penn State. Ohio State bowlers also received high game and most team spirit awards! The next tournament is scheduled for mid-August. Go Bucks!